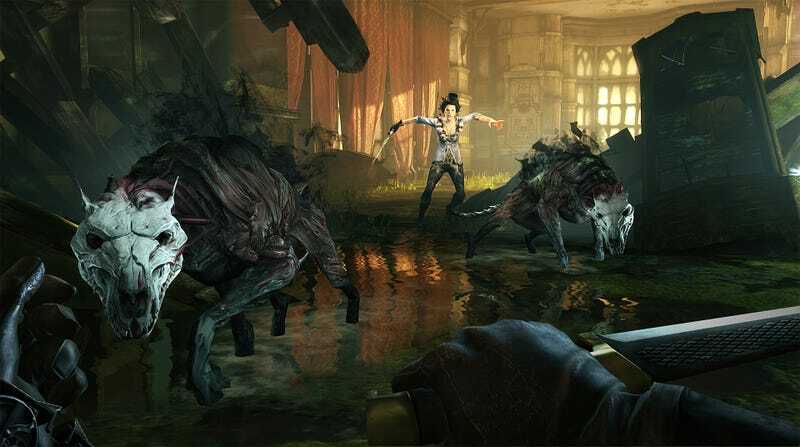 It all comes to a head August 13, when the final downloadable content for Dishonored hits the PlayStation 3, PC and Xbox 360. Picking up where The Knife of Dunwall DLC left off, Dishonored: The Brigmore Witches continues the adventure of legendary assassin Daud, as he hunts down a coven of powerful witches and finally answers for the crime that set the original game in motion. What follows is the spoiler-heavy official description for the DLC, available on August 13 (August 14 of Euro PS3) for $9.99. If you haven't played The Knife of Dunwall yet, what is wrong with you? Also, don't read this. In The Brigmore Witches, continue your journey as the legendary assassin, Daud, and bring his twisted narrative that began with The Knife of Dunwall to a close. After discovering the identity and intentions of Delilah, the leader of the Brigmore Witch coven, you set out to disrupt her from completing a powerful ritual that will spell your doom. Having already been betrayed by your lieutenant, Billie Lurk, you must rely on feuding gang factions—the Dead Eels and the Hatters—to negotiate your way through previously unseen districts of Dunwall en route to Delilah’s stronghold. Regardless of the way you reach your destination, one thing is for certain – you will finally answer for your treacherous actions and fall before the mercy, or punishment, of the Royal Bodyguard and Assassin, Corvo Attano.